God’s word says that His presence is like a light… I’ve been thinking on this for a couple of days. His presence is like a light. A light reveals, and our response is that either it draws us, or it repels us. When you turn on the outside light at night, moths and bugs usually flock to it. They are DRAWN to the light. But also, when we turn on a light in a dark place, like my shed or outside storage room, roaches run for cover… They are HIDING from the light... In Luke it tells of the time when Jesus was in the boat with the disciples and they made the miraculous catch of fish (one of His first miracles that they saw), Peter’s response was, “Please leave me Lord. I am too much of a sinner to be around You.” Thankfully Jesus’ response to him was, “Don’t be afraid.” And Peter and the others left all and followed Him.” They chose to draw near. I just read this morning the account of when Jesus cast the legion of demons out of the possessed man of Gadarenes, how the locals, even after viewing the formerly demon-possessed man, clothed and in his right mind sitting at the feet of Jesus, how they begged Jesus to please LEAVE the area… And He did! Their response was to move away from the Light, or rather to ask the Light to move away from them! The Israelites at Mt. Sinai were given an opportunity to draw near to the Living God, but they pulled away in fear and (basically) said, "Moses, YOU tell us what He says. We prefer to stay at a distance and not get too close." Oh mercy! And my question is- what will our response be to His presence? Honestly, there have been times when I wanted to run. I might not actually run or consciously ask Him to leave, but I would busy myself with GOOD things. Ministry things. Nothing wrong with that, right? But like with busy Martha and worshipping Mary, what did Jesus say the better thing was? Mary's way-To just sit at His feet, to gaze into His face and to just enjoy His presence- to WORSHIP! As the sense of His presence is increasing in our worship services, it is a choice we have to make to draw near and to really FOCUS on Him when there is so much in this life, even good things that can distract us and take our attention away. We don't need to wait for Sunday morning or Wednesday night to worship. Fellowshipping with Him should be a part of our life, just as fellowshipping with our family members is... This is a challenge and I am praying for this to become to me as natural as breathing! I’ve been thinking about this for some time and praying that the Lord could really help me to focus my FULL attention on Him during corporate worship and during quiet times of fellowship with Him. Pastor Ralph encouraged our worship team a couple of weeks ago with this also. You would think that for Christians that would be an easy thing for us to do. But it’s possible for us to be busy FOR God and yet miss Him entirely. During a church service, how is it that we would never think of visiting, talking and taking care of business (I need to talk to this person and give them this or that), during the preaching but we feel totally comfortable to do that during worship time? We have no problem giving the Pastor our full attention during the time of hearing the word of God. But during worship, we will visit and go in and out of the sanctuary rather than giving our awesome, holy God our FULL attention during HIS time. Worship is all about Him and nothing else. It is HIS TIME. If we had an audience with the President of the United States, would we not give him our full attention? Would we be distracted? Would we say, "excuse me Mr. President" and then go busy ourselves with something else, while he waited for us? I don't think so. I think most of us would count it a privilege to have an appointment with the President and would honor that time, focus on him and him only and remain with him during his appointed time. So why, when we have an audience with the King of kings and the Lord of lords, do we treat that time as common and optional? How much more should we honor and value the time in our services set aside to focus on and to draw near in worship to our God. He certainly was focused on us when He sent His only Son to die so that we might have life. Don't we at the very least owe Him our uninteruppted, full attention? These are questions I ask myself... I don’t mean to sound judgmental or legalistic. God knows we have to take care of our children and often have to deal with things like that during worship time but I’m more talking about an attitude of the heart. Worship isn't meant to be optional. Worship is high on God's priority list. It is a time to focus on Him alone, not on the songs, the worship team or the pastors. In the Church (the Body of Christ as a whole, not just our church) there is often a casualness about worship and what it really is. I’ve heard and I believe that the Lord is restoring worship to its proper place in these latter days. Like it was in the days of the King David and Solomon, worship is meant not as entertainment or as a nice way to warm up a church service but rather it is a vehicle to transport us into the glory of the Living God! Whoa! Into the presence of the Living God! Into His Light! How can we treat that casually, take it or leave it or come in and out of it? Why would we want to?! Pastor Ralph shared with our worship team how as worship leaders, rather than us LEADING the congregation into the presence of God, it’s more like we BRING the presence of God down to the people. I’d never thought of it like that before. Worship prepares hearts for the message of the Word and opens the way for the prophetic. Elijah (or was it Elisha?) asked for a minstrel to play before he gave the word of the Lord to the king. When we have been in a time of worship, we have been with God. We have focused on Him and have put everything aside for a period of time to draw near Him and to give Him what is due Him. Our hearts are enlightened, softened and prepared and we are better able now, to receive the word of the Lord. 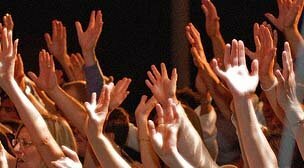 The Bible says that God INHABITS the praises of His people. And the devil doesn’t like that ONE BIT! He’s going to do everything he can to distract us from coming into the Light, from focusing and truly worshipping God as He deserves. We usually have enough sense to not be tempted with BIG sins, but it’s the little distractions during worship that trip us up and get our eyes on anything but God. Believe me, I know about those! Even as a worship leader I have to fight often to stay focused. The devil is afraid of the Light, like those roaches in my storage shed! It EXPOSES him and he likes to stay hidden so he can do his dirty work. He is afraid of the presence of God and what will happen when God's people really come together in the light, in unity and worship the Living God corporately. He's going to fight us tooth and nail to keep that from happening because he knows how powerful our worship is. But as I said before, God's presence is increasing in our church. I am challenged in that we have an incredible opportunity RIGHT NOW to press in, to draw close during this time in a way we’ve never had before. My prayer for myself, my family and our church is that we would RECOGNIZE this open door and the times we are in and we would CHOOSE to focus on God, even when it’s hard, in order to draw near to Him during this time. For He promises that when we draw near to Him. He draws near TO US! Praise the Lord! As we sang last night- “I want to be with You where you are Jesus”. I have to admit, Kayla, I giggled the first wed. night you shared about the roaches :) but the point is powerful. I'm with you in wanting our church family (and the Church at large) to draw near to the Lord...to allow Him to expose the darkness in our hearts, so that the darkness will flee and we'll be drawn even closer. Wow, may we continue to draw closer to the light in order to become pure and spotless of the heart; which in return brings FREEDOM and REVIVAL and not to mention a GREATER outpouring of HIS incredible, unconditional LOVE!!!! Now, I could sure drink and eat that meal DAILY! I wanted to post this on Max's blog but could not since I don't have a blog account. As of today, the IHOP prayer room is on streaming video! If you want to get it, got to www.ihop.org/ and click on the "Media & Webstream" button.